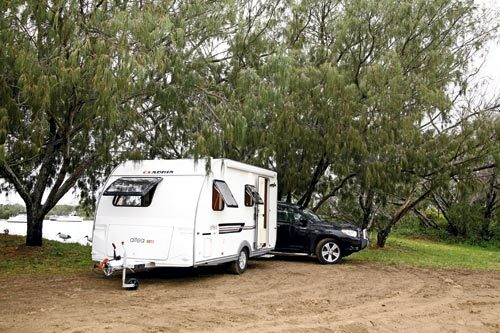 Many Australian caravan manufacturers opt to build larger caravans, with the accompanying weight penalty that goes with it, while European manufacturers tend to go in the opposite direction, keeping size, and particularly weight, down. The Adria Altea 432PX is an example of this design philosophy. 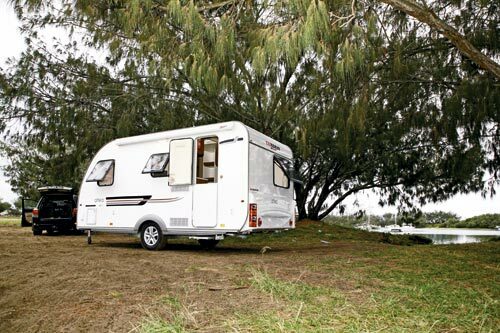 It’s one of a number of caravans that importer RV Asia Pacific brings into Australia from Slovenian manufacturer Adria. 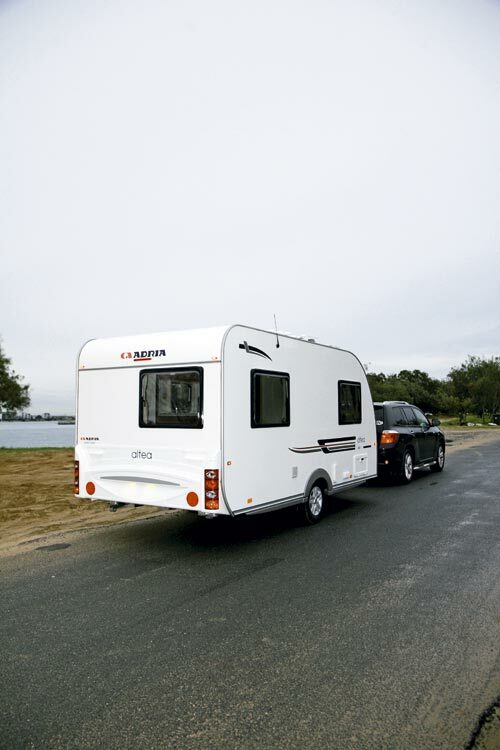 While Adria does manufacture a wide range of caravans and motorhomes, RV Asia Pacific only imports a limited selection of those. 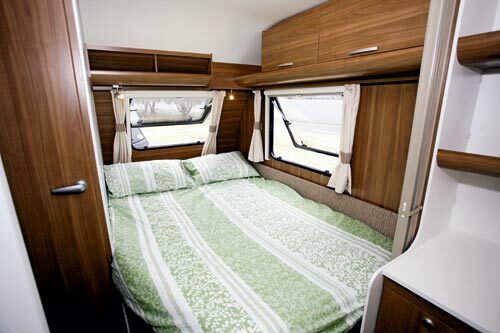 The Altea 432PX has a body length of 4.81m (15ft 9in) and a Tare of 1030kg, yet it manages to squeeze in a fixed double bed and a small bathroom. Al-Ko employs its standard chassis design for the European models, with punched-hole C-section for the main rails. But there are a few changes for the Australian imports. In all models, the drawbar rails are simply an extension of the chassis but the Australian version has the addition of an extra set of parallel rails running forward of the axle, and an extra cross member is added as well. Although it’s not readily apparent to the casual observer, the rails are about 1.5mm thicker than the standard Euro chassis. It might not sound like much, but it all adds about 200kg of weight to the chassis. The insulated floor is glued and bolted to the chassis. The walls and roof are a composite structure with ply timber on both sides of 30mm insulation and an outer coating of polyester. The front and back walls are made from GRP – that’s moulded fibreglass to you and me. 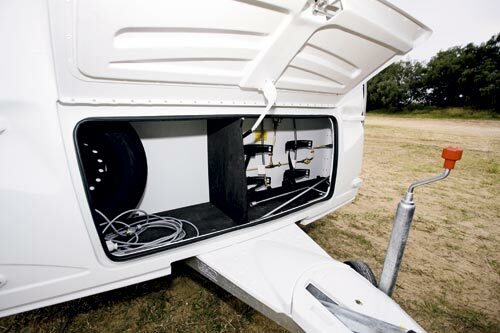 The front moulding includes a boot, which is large enough for two gas cylinders, a spare wheel and space for some of the essential caravanning accessories. The front offside corner storage bin contains a 95Ah battery and the power cord connection. The standard European socket has been left in place but the necessary power lead with appropriate plug connection is supplied with the van. An Al-Ko AKS 1300 stabiliser coupling is used instead of the more common ball hitch. It works in a similar way to the higher-rated AKS 3004, with both horizontal and vertical friction pads to minimise sway. It is rated to 1360kg, which is certainly adequate for this van. Entry to the Altea is via the rear stable door – the lower half can be closed while the top half is left open. But the lower half has a moulded garbage bin attached, so it can’t be closed if the roller-blind insect screen is also closed. The Altea has a relatively compact layout, which is not surprising given the length of the van, but there is enough space for everything, including room to move. Opposite the door is a dinette which, together with the kitchen to the left of the door, fills the rear of the van. 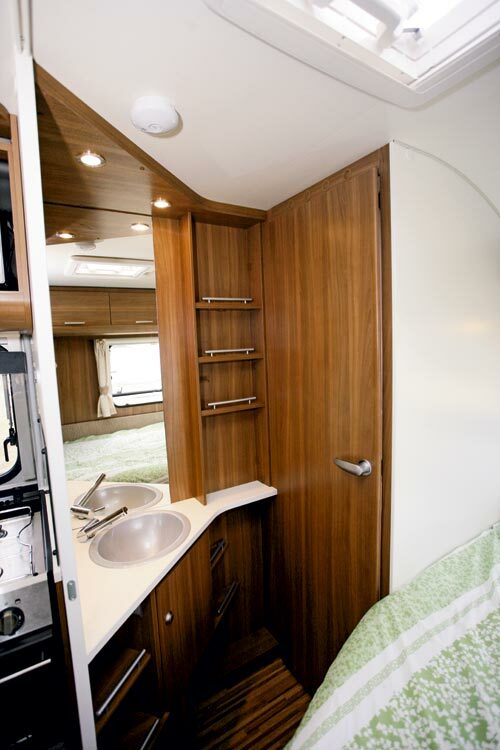 Up front, the bed takes up the offside corner, leaving the nearside for a small, but adequate, bathroom. In many ways, this is a typical European layout with a matching style and décor. 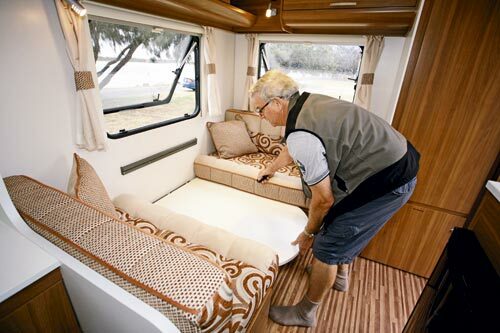 Having a fixed bed in a van of this size invariably means it will have to be a corner bed, as this one is. It is 1.88m (6ft 2in) long but has a chamfered side which reduces the width from 1.4m (4ft 7in) to 1.1m (3ft 7in) at the end. 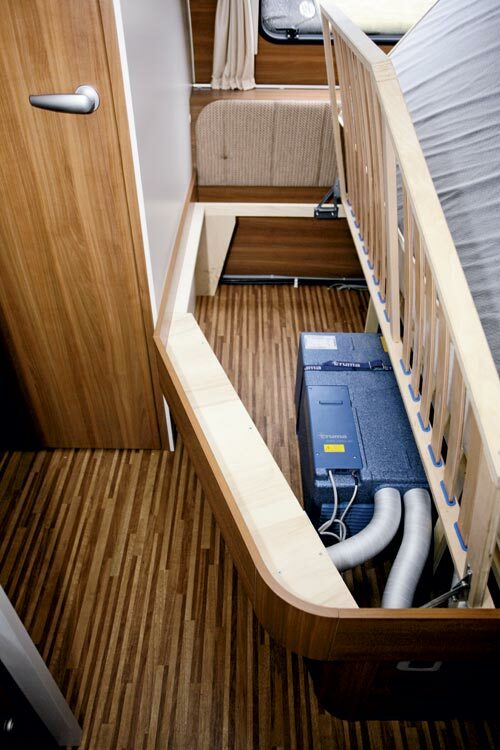 The mattress sits on a posture-slat bed base, hinged down the middle so it is easily lifted to get to the storage space underneath.The Truma air-conditioner takes up some of this space. 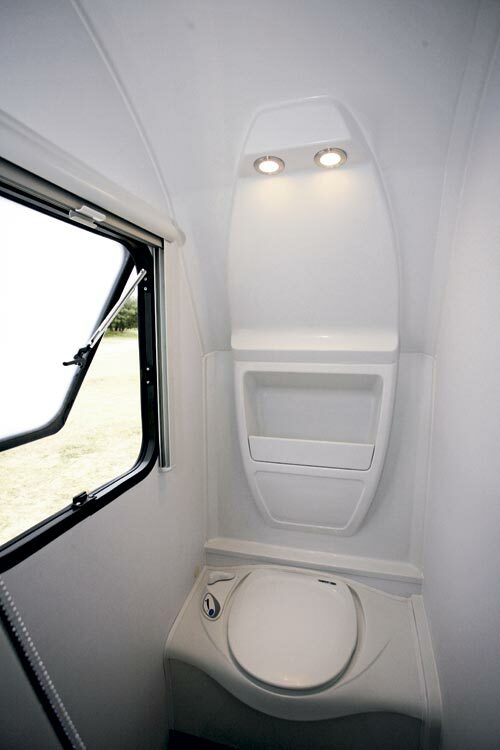 Although the bed is wedged in beside the toilet cubicle, windows on the rear and side walls keep it reasonably open. There isn’t a great deal of storage around the bed, but there are two overhead lockers, two open shelves, and the full-height cabinet between the bed and dinette has shelves and drawers. 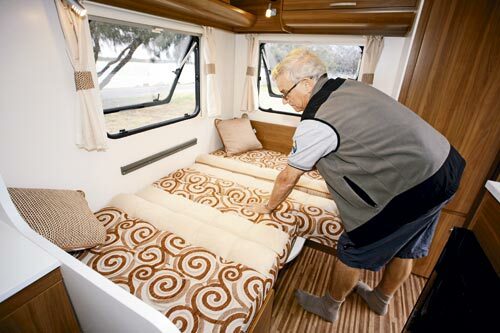 An additional feature, which is not seen on many Australian caravans, is the spacer that sits between the mattress and the walls – it’s a simple fitting that solves the problem of water condensation in cooler weather. The same feature is fitted between the seat cushions and the wall. In a bathroom this small, you might expect the designers to utilise that clever little moulding that includes a cassette toilet, folding sink and shaving cabinet, but they haven’t. Instead, the Thetford cassette toilet sits by itself against the front wall and above it sits a simple moulding with downlights and a moulded soap/shampoo holder. The fixed-height, flexible-hose shower is in the corner between the door and the frosted window, leaving room outside the bathroom for a well-appointed corner vanity cabinet with shelves and a cupboard. There is also a good-sized, well-placed mirror. The light switches under the vanity benchtop are a bit difficult to find, but are easy enough to locate after being used a few times. 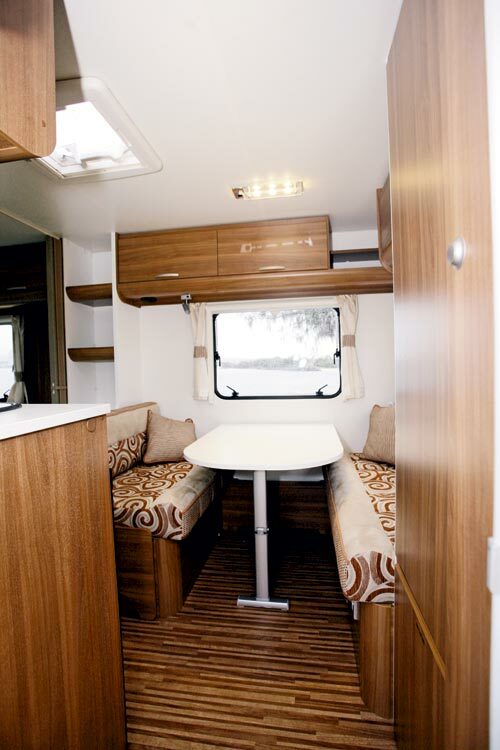 The Altea 432PX’s kitchen is typically European and relatively small. It has a three-burner cooktop with grill/oven and microwave above, along with a stainless steel sink and 108L fridge below. Benchtop space is minimal and there’s just one overhead locker and one cupboard. All that might sound a bit critical but, in reality, the kitchen fits in with the rest of the van in being designed for lightweight travel. One of the little surprises in this van is the rear corner dinette. It has windows on two sides and will seat four people, on quite comfortable cushions, without too much trouble. I mention this to show just how much space there really is in this van because often dining facilities in a van of this size are just jammed in. There’s no problem with lighting in this area with both a well-placed overhead fitting and two reading lights. In addition to the overhead lockers, there is storage space under the seat cushions. This dinette folds down into a spacious two-person bed. It looks like it might be a chamfered shape but an extension piece from the front seat squares it up nicely. I don’t think four people could live comfortably in this van long-term but it would be ideal for occasional overnighters. Adjoining the dinette is a full height cabinet that supplies a generous amount of hanging space and a narrow multi-shelved area. With a loaded weight of just 1300kg and a ball weight somewhere between 62kg and 100kg, this little Altea 432PX will suit an incredibly wide range of tow vehicles. 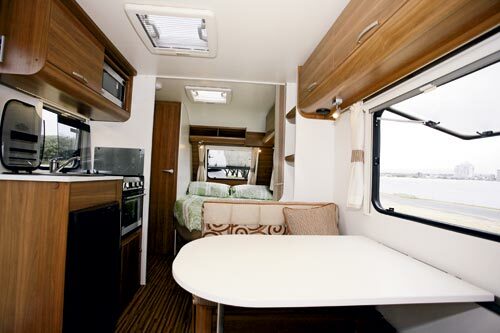 Sure, it doesn’t have a huge interior but it does have all the basics that the modern caravanner needs and there really isn’t a millimetre of space wasted. Overall, this van is suited to anyone who wants lightweight travel with all the conveniences. 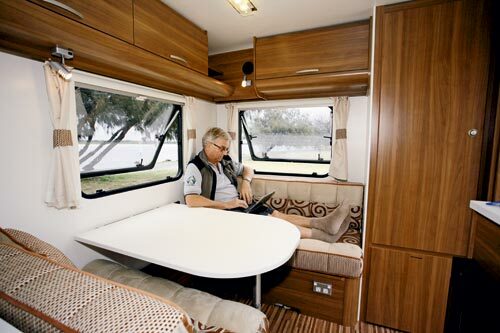 It’s a fact that imported caravans have a somewhat chequered history, which in some cases more to do with the long-term permanence of the importers as it is the products themselves. Adria and the importer/distributor RV Asia Pacific, under the direction of Chris Swann, however, has been one of the stayers, negotiating its way through the difficult path of compliance, service and warranty, as well as the unwanted problem of ‘grey imports’, so buyers can not only have confidence in the product but long term after-sales service and back-up. All that creates a good deal of confidence in the Adria product. Grey imports are so-called because they find their way into Australia by some channel other than the manufacturer’s official distributor. They are often a problem for unsuspecting buyers because they have no service and repair back-up. Additionally, a company like RV Asia Pacific is only required to keep and supply spare parts for the limited range of caravans they import. Anything else is simply not going to be readily available and sometimes the official importer (not only Adria) gets caught in the crossfire, even in some cases from those who should know better. With ‘grey imports’ it’s very much a case of caveat emptor, especially when buying a second-hand van. 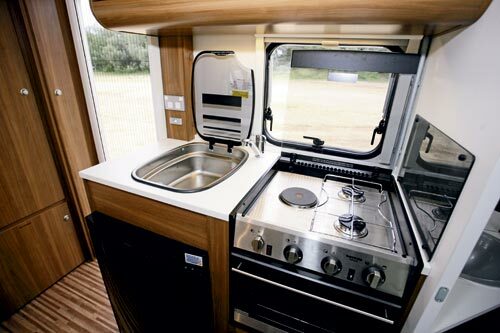 This van has quite a small kitchen, like many British and European RVs. It also has a relatively large vanity cabinet. Now, I know it depends on how you travel but would it make more sense for the van to have a larger kitchen and no vanity cabinet? In a van of this size, would it matter if the kitchen sink was used for both washing up and cleaning your teeth? Especially since, I suspect, that many of its owners would be staying in caravan parks anyway and would have the use of the amenities block.